Cleft lip nasal deformity offers a unique challenge to the reconstructive surgeon for many reasons. First, clinical presentation of cleft lip varies widely, requiring a host of surgical techniques. Second, deformity may be quite severely asymmetric, making surgical correction difficult. Third, patients with cleft lip may have been previously subjected to numerous surgical interventions, leading to significant scar tissue in the operative site. Fourth, timing of rhinoplasty, whether synchronous or staged with cleft lip repair, is controversial. Fifth, this nasal anomaly affects the pediatric population, and the patient's growth affects surgical results. Conversely, the surgery may adversely compromise nose growth. This article is intended as an introduction to basic clinical features of the deformity, shown below, and to some surgical options for correction. Cleft lip nasal deformity. A: Basal view. B: Frontal view. Historically, cleft lip nasal deformity has received less attention than primary lip repair or has been ignored altogether. In pre-Columbian figurines, cleft lip was sculpted accurately, but nasal appearance was depicted incorrectly as normal. Rhinoplasty for cleft lip was not introduced until the turn of the 20th century. Most modern techniques had already been described by the 1920s-1940s, albeit with less refinement (eg, open rhinoplasty incisions were placed along the alar rim, leaving a conspicuous scar). It was not uncommon for patients to have undergone as many as 20 procedures for cleft lip/palate/nose. Currently, the literature offers numerous opinions regarding the best surgical approach and timing of intervention. Patients with cleft deformity have cosmetic problems and impaired nasal airflow as a result of distorted anatomy. These patients have septal deflections, atretic nostrils, turbinate hypertrophy, and cleft lips and palates. Nasal rhinometry has demonstrated statistically significant findings of smaller airways in patients with cleft deformity when compared to patients without cleft deformity. Warren et al showed that children with unilateral cleft deformity have smaller airways than children with bilateral cleft deformity. However, these differences do not persist over time. Although the cleft nose grows as the patient ages, it remains 30% smaller than that of patients without cleft lip deformity. Embryologic origin of cleft lip nasal deformity is not well understood. Curiously, classic nasal anomaly of patients with cleft lip may exist in absence of any cleft lip deformity owing to fetal derangements affecting only the nose. The nose is derived from two distinct tissue masses, the frontonasal and lateral facial complexes. Frontonasal processes that migrate over the forehead constitute the nasal placodes. 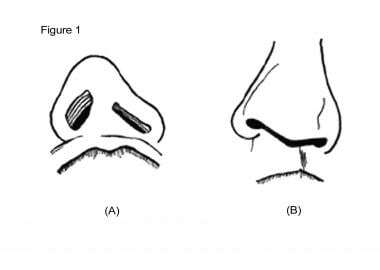 In turn, nasal placodes develop into the medial and lateral processes, forming the columella and alae, respectively. Theory holds that mesodermal growth of the alae may follow growth of the central portion of the nose. Any disruption of this process may result in unilateral nasal deformity. Furthermore, incomplete union of the frontonasal and lateral facial complexes may contribute to clefting. Clinical presentation of cleft lip varies widely. Deformity may be quite severely asymmetric. Septal deflections, atretic nostrils, turbinate hypertrophy, and cleft lips and palates are presenting features. Patients with cleft lip may have significant scar tissue from previous surgical interventions. The major defect of cleft lip nasal deformity concerns the position of the ala. The ala lies inferior and lateral to the contralateral side; its relative position falsely lengthens the nose on that side. The ala rests on an underdeveloped premaxilla, which partly accounts for alar base lowering and horizontal nostril seating, as depicted in the image below. The ala is often underdeveloped and weak, exhibiting a convoluted shape. This contributes further to dome lowering on the cleft side. Because of the abnormal ala, the columella is foreshortened and lies obliquely, with its base directed away from the cleft side. Bone growth is retarded on the cleft side; nasal bones and the nasal process of the maxilla are underdeveloped, causing the nasal dorsum to tilt to the cleft side. The septum may lie outside of the maxillary crest seat, and the cartilaginous portion may be buckled, both of which may cause nasal tip deviation. The nasal septum exhibits a wide range of abnormalities in addition to obvious external cosmetic deformities. When cleft palate coexists with cleft lip, significant bony abnormalities may occur along the nasal floor, including nasal-oral fistula. Bilateral cleft lips may also reveal a duplicated thickened septum, which is postulated to represent failed growth of 2 septa. Studies have confirmed the presence of significant septal deviation in patients with bilateral cleft lip when compared to patients without bilateral cleft lip. The septum tends to deviate toward the cleft side, with the cartilaginous base displaced off of the maxillary crest toward the cleft side. 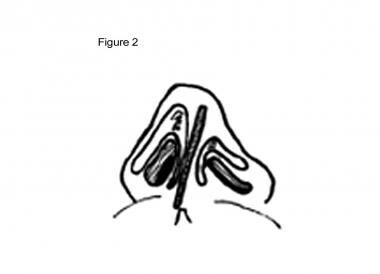 This septum malposition contributes to nasal tip tilt toward the noncleft side, as depicted in the image below. Cleft lip nasal deformity. Septum deviated toward cleft side and lying outside of maxillary crest. Surgical intervention for cleft lip nasal deformity may be contraindicated in certain conditions. No absolute age minimum exists for nasal reconstruction. However, nasal surgery should be elected after age 5 years to permit sufficient physical and psychological maturity to develop before surgery is undertaken. Major septal surgery may be performed later in combination with or independent of external nasal surgery to allow for maximal time for development in this important facial growth center. As alluded to, psychological maturity is a critical consideration so that realistic and mutual goals may be set by the surgeon and patient before rhinoplasty surgery is undertaken. Warren DW, Drake AF, Davis JU. Nasal airway in breathing and speech. Cleft Palate Craniofac J. 1992 Nov. 29(6):511-9. [Medline]. Monson LA, Kirschner RE, Losee JE. Primary repair of cleft lip and nasal deformity. Plast Reconstr Surg. 2013 Dec. 132(6):1040e-53e. [Medline]. Khosla RK, McGregor J, Kelley PK, Gruss JS. Contemporary concepts for the bilateral cleft lip and nasal repair. Semin Plast Surg. 2012 Nov. 26(4):156-63. [Medline]. [Full Text]. Liao YF, Wang YC, Chen IJ, Pai CJ, Ko WC, Wang YC. Comparative outcomes of two nasoalveolar molding techniques for bilateral cleft nose deformity. Plast Reconstr Surg. 2014 Jan. 133(1):103-10. [Medline]. Meltzer NE, Vaidya D, Capone RB. The Cleft-Columellar Angle: A Useful Variable to Describe the Unilateral Cleft Lip-Associated Nasal Deformity. Cleft Palate Craniofac J. 2012 Jan 11. [Medline]. Kiya K, Oyama T, Taniguchi M, Hosokawa K. Simultaneous correction of deviated columella and wide nostril floor using the Y-V advancement in unilateral cleft lip nasal deformities. J Plast Reconstr Aesthet Surg. 2013 Dec 12. [Medline]. Metz AS, Pfortner R, Schmeling C, Rieger G, Mohr C. Nasal Entrance Correction in Unilateral Cleft Lip Repair. J Oral Maxillofac Surg. 2015 Oct. 73 (10):2038.e1-7. [Medline]. Wei J, Herrler T, Xu H, Li Q, Dai C. Double Composite Tissue Z-plasty Technique for Anatomical Restoration of Severe Nasal Deformity in Secondary Unilateral Cleft Lip. Ann Plast Surg. 2017 Aug 14. [Medline]. Yan W, Zhao ZM, Yin NB, Song T, Li HD, Wu D, et al. A new modified forked flap and a reverse V shaped flap for secondary correction of bilateral cleft lip nasal deformities. Chin Med J (Engl). 2011 Dec. 124(23):3993-6. [Medline]. Chetpakdeechit W, Hallberg U, Hagberg C, Mohlin B. Social life aspects of young adults with cleft lip and palate: grounded theory approach. Acta Odontol Scand. 2009. 67(2):122-8. [Medline]. Feijo MJ, Brandao SR, Pereira RM, Santos MB, Justino da Silva H. Nostril Morphometry Evaluation before and after Cleft Lip Surgical Correction: Clinical Evidence. Int Arch Otorhinolaryngol. 2014 Apr. 18 (2):192-7. [Medline]. [Full Text]. Yoshimura Y, Okumoto T, Iijima Y, Inoue Y. Reduced nasal growth after primary nasal repair combined with cleft lip surgery. J Plast Reconstr Aesthet Surg. 2015 Nov. 68 (11):e159-66. [Medline]. Cleft lip nasal deformity. Ivy modification of the Blair procedure. Laterally based nostril rim flap rotated medially inward. Cleft lip nasal deformity. Dingman technique. Nostril rotated via columellar and alar-based flap. Cleft lip nasal deformity. V-Y advancement for columellar lengthening. Cleft lip nasal deformity. Rectangular flap for columellar lengthening. Cleft lip nasal deformity. Brauer-Foerster procedure for columellar lengthening via medial rotation of bilobed flaps. Cleft lip nasal deformity. Cronin procedure for columellar lengthening. Anteriorly based bilobed flap is advanced anteriorly, and posteriorly based columellar flap is advanced posteriorly. Cleft lip nasal deformity. Ferris-Smith procedure. Repair of total columellar loss; full-thickness skin graft (FTSG) is buried beneath upper lip skin and later rotated into place. Cleft lip nasal deformity. Serre method. Repair of total columellar loss; doubled full-thickness skin graft (FTSG) is buried beneath upper lip skin and later rotated into place. Cleft lip nasal deformity. Elevation of nostril apex by excision of skin wedge. Cleft lip nasal deformity. Thomas Rees technique. Lateral crus of lower lateral cartilage is severed from lateral attachment and advanced medially to be sutured to contralateral ala.
Cleft lip nasal deformity. Tajima reverse-U technique. A: Intranasal incision. B: Suture ala on the cleft side to (1) ipsilateral upper lateral cartilage, (2) contralateral cartilage, and (3) contralateral ala.
Cleft lip nasal deformity. Cartilage grafts. A: Onlay alar graft. B and C: Turnover alar graft. Cleft lip nasal deformity. Bilateral cleft lip nasal deformity. Broad, flat, bifid tip; wide alar bases; and short columella. A: Frontal view. B: Profile view. Cleft lip nasal deformity. Millard classic forked flaps. One taken from each side of prolabium and banked within nasal sills during primary lip repair until secondary rhinoplasty.